Nestled in a pocket of the Cerbat [sir-bat] Mountain Range, the town is at an elevation of 4000'. The name Chloride came from the silver chloride found in the hills among other minerals in the area. Today, silver chloride is used in photographic emulsions and antiseptic silver solutions. From 1868 to 1919, the Butterfield Stage Line serviced Chloride and surrounding area. The stage stop and repair station was located at the building presently known as Yesterday's Restaurant. In 1898, the Sante Fe Railroad began laying tracks from Kingman into Chloride. The railway station still stands today and is fairly intact. In 1910, tracks from the railway station were continued on to the Tennessee Mine, which was the largest of all mines in the area. The Santa Fe Railroad provided both passenger and cargo service until 1935 when the decision to close the station was made. 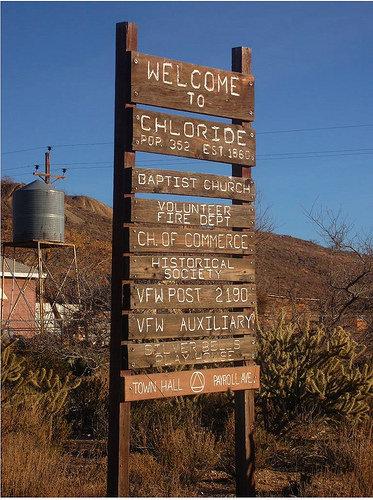 In 1871, Chloride became the Mohave County seat. The population escalated to approximately 5000, but dropped to 2000 around 1917. It stayed that way until 1944, when the mines were closed due to the low prices of silver and other minerals. Chloride became a virtual ghost town. Presently, the continuous population is around 150 and reaches a high of 250 during the winter months when "snow-birds" come in from the cold. Many of the present day citizens are retirees, artists, musicians, and the like. Some residents work locally, some have their own shops, while others work in the casino industry in Laughlin or Las Vegas or are employed in one of many businesses in Kingman. 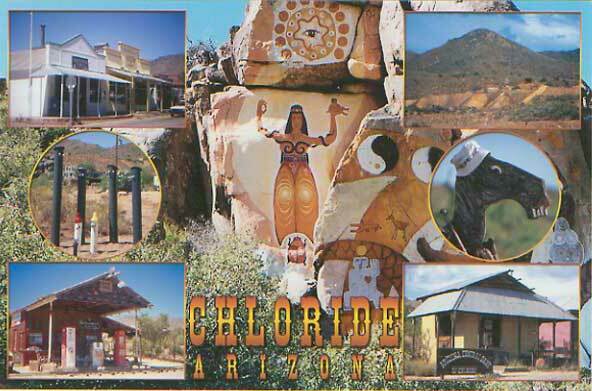 Approximately 20,000 tourists from all over the World travel into Chloride each year, with many stopping at the Visitor Center in the Mine Shaft Market. Shop owners sell handmade jewelry, antiques, and just plain junk. There are two restaurants, two bars, several gift shops, a convenience store, fire station, and a few interesting tourist sights, including the historic post office and train station.